I was sitting a few days ago, doing my morning routine, and I realized that all of the different things that I do for my health, wellness, and well-being, are free. Well, almost all. And I couldn’t believe it. The idea that your health can be repaired and rejuvenated for free, is a mysterious idea, isn’t it? I mean, we are all always looking for that special pill, that magical fountain. We think these cures will cost a lot of money. But we tell ourselves it’s okay, because the idea is the more something costs, the better it works. Right?? The reason I wanted to share this with you, is because perhaps a lot of you out there are thinking the same thing. That your health requires a lot of money and a lot of time in order to repair. You might be thinking that you need fancy equipment, and measures in order to become the best version of yourself. I’m here to tell you, you are absolutely wrong. The techniques or practices I mention in this blog post are powerful beyond measure, and so simple to do. Moreover, they are free, and can be done without any equipment, in the comfort of your bedroom, without any preambles (except perhaps speaking to your family physician, in case you have certain medical contraindications). There are many different things you can do to repair and rejuvenate yourself, but in this blog post, I will be focusing on the ones that I have already tried. These are tried and tested by me, which means, I know that they have worked for me. Of course, your body might be different, so I would recommend trying out these techniques for yourself, and seeing the benefit of them or not, on your own health. I believe no conversation on health, wellness, or well-being, mental, physical, or spiritual, would be complete without a major diatribe on meditation. If you have been searching for that magical elixir that is going to absolutely transform your life and health, look no further. Meditation is it! Seriously, there is nothing else like it. And what do you need to meditate? Nothing, nothing at all. Just a cushion or a pillow that you probably already have in your living room or bedroom, a physical body which you should have if you are a human, and a discipline to keep on meditating every day for the rest of your life. The basics of meditation are as follows – you focus on your breath, and every time, your mind gets distracted, you bring your mind back to your breath, over and over and over again. A hundred times over, if necessary. That’s all. I implore you guys to add this awesome, powerful, life-changing practice into your morning routine right now!! Breath is life. You have heard of this adage before. Even right now, you are sitting there reading this post, and breathing at the rate of one breath per second, more or less. We cannot live without breathing. We can go without food or water for longer periods of time, but without breath, perhaps, a few minutes. There are 25 different kinds of breathing exercises out there, called Pranayama. There are many different kinds, but I focus mostly on three or four, that I try to do daily. The one that has caused the most impact in my life is the Wim Hof method, which I am sure you have heard of before. Most of us spend all of our lives disconnected from our breaths. 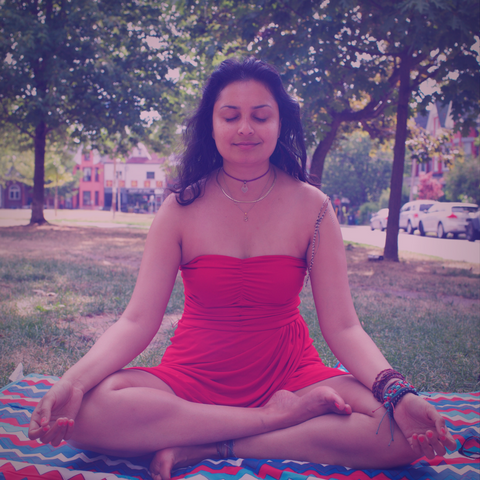 But Pranayama breaks the cycle of disconnection, and brings our focus back onto our breaths, which means, we breathe deeper, and more consciously, and that causes all sorts of positive chemical reactions in the body, changing our physiology and our psychology. I am sure by now, unless you have been living under a rock, you know how amazing Yoga is. The practice of daily yoga can really transform your body, mind, and spirit. There are so many different kinds of yoga out there, that I don’t think I could recommend one technique to you. Although, my favourite has always been the Yin Yoga, because it really helps my Vata Ayurvedic body type to ground itself, and relax its anxiety. I think the best thing to do is to try out the Sun Salutations routine early in the morning. Do this as soon as you wake up, to wake up your body, mind, and spirit, and to let yourself feel the power that is contained in your physical body. You are so much more than your body, of course, but your body is still so powerful and awesome. Also, try out Super Brain Yoga, which is a powerful technique to enhance the amount of oxygen your brain receives, and improves your brain’s memory and healing powers. Journaling is magical. All you need is a piece of paper, and a pen or pencil, and you can write down your dreams, hopes, desires, goals, thoughts, feelings, and everything else. It’s magical because just through the act of writing, you are able to heal yourself. You write down your anger, and it dissipates from your body. You write down your trauma and pain and it releases its hold on your mind and spirit. I love journaling early in the morning as soon as I wake up. I also do it once again before I fall asleep. In the morning, it helps me recall my dreams, and think about why I am excited about the day that is to come. And then at night, it helps me think about the day that just passed, and how it went, did I do something wrong or right, and what I want to achieve tomorrow. It’s my free daily therapy. This one is a difficult one for most people to adopt, but I have found so many health benefits from this technique that I had to include it in this list. Please do check with your family physician or medical practitioner before you start this technique if you have any health issues at all. The basics of IF is that you fast for 16 hours and only eat for 8 hours of the day, or you can even do the less stringent 14 hours off, 10 hours on fast. This daily fasting helps your body in a myriad number of ways. It has taught me about hunger. About how a lot of my hunger is based on boredom, rather than actual hunger in the body. It also has an enormous effect on detox and clean-up of the body’s toxins, which cleans up the brain, and body, and allows you to reset yourself. I would recommend you read up on it, and see if this is something that would work for you. This is how I set up my day to include all of these awesome practices. I wake up early, usually around 530am. The sun wakes me up. I do a bit of journaling, my dreams, and my thoughts, out on a journal that sits by my bedside. I do my Wim Hof breathing, and then my 30 minute meditation, right after that. Then, I do a few yoga poses, including the Super Brain Yoga. And, a few minutes of walking (another free technique that’s really healing for the body and mind). And then I have my first meal after the 16 hours of fast that I usually start around 5 or 6pm the previous day. Let me know if you are able to incorporate any of these techniques in your own routine. Thanks for reading!